Thanks to those who helped with with the screengrabs I was after – here’s my completed cover for The Twin Dilemma. Click here or on the thumbnail to download, and here to read about its creation. Love to know what you all think. 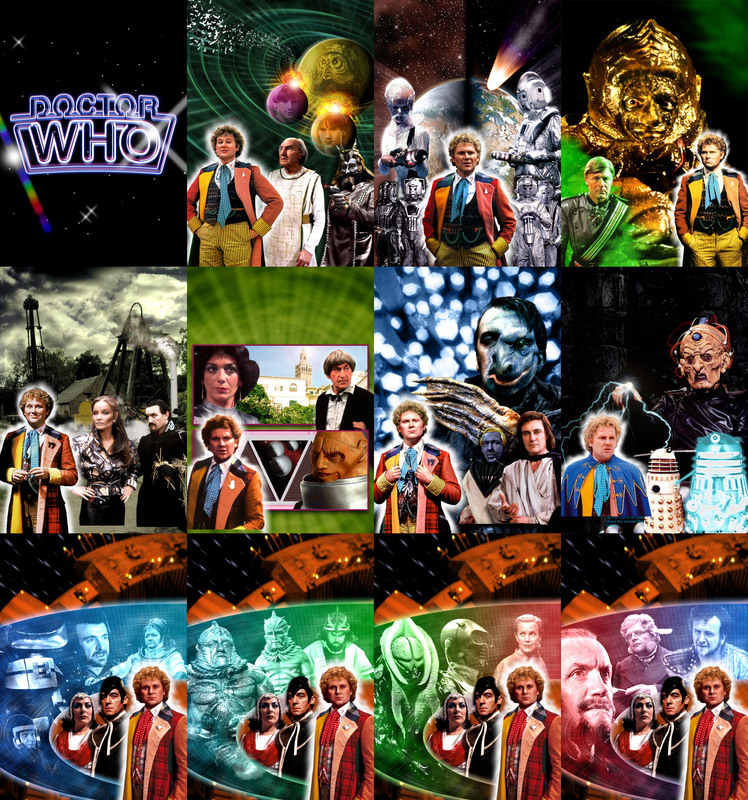 As this is the last of the Sixth Doctor covers – the first complete ‘era’ (unless you count the Eighth Doctor’s sole showing as an era) – I thought I’d show you the clean artwork for them all at a clearer size than the website gallery. Click on the image below for a much bigger version. Thanks to all who sent in images, you’ve been a big help. The finished cover should be up later this weekend. My Twin Dilemma cover is coming along nicely, but I wonder if someone could do me a favour and take some screengrabs from the DVD’s photo gallery for me (haven’t got the disc myself yet). The two shots I need are below. I found them on the wonderful Tragical History Tour but they’re too small – grabbed, I’d guess, at actual pixel size. Could someone take grabs for me at full screen size – doesn’t matter if they’re magnified and a bit fuzzy, just as big as possible (so the bigger your screen the better)? After something of a delay (see ‘Back in the saddle’ below) here at last is my cover for Enlightenment, finishing off the Black Guardian trilogy boxset. Read about its creation here and do please leave a comment with your thoughts – they’re always useful to hear. I have some time off work so I hope to get on with further covers straight away, starting (probably) with The Twin Dilemma. I do hope to get up to date with the Dalek War boxset before the New Year but recent experience has made me wary of promising too much. Still, new Mac is gorgeous so any excuse to use it is welcome! Sorry to all those waiting for new covers, particularly the last instalment of the Black Guardian trilogy. I’ve had a busy, stressful month, most pertinently involving my computer playing up, so I’ve been offline for a while. Annoyingly it managed to crash while I had parts of the Enlightenment cover open and corrupted the files, meaning I’ll have to do a load of work again. However, I have now availed myself of a shiny new Mac and finally transferred all my old data. So I can get back on the cover wagon and hope to have Enlightenment finished this weekend, followed by The Keys of Marinus, The Twin Dilemma, Frontier in Space and Planet of the Daleks before the new year.